Warning. You may not want to read this page if you are of a squeamish disposition. It contains explicit descriptions and pictures of a surgical procedure. I have previously written up my tale of an ACL reconstruction. I had hoped I wouldn't have any more medical problems, but during the summers of 2000 through 2002 especially, I found my right shoulder aching badly after archery and when fly-fishing. I eventually went for a diagnosis to an orthopaedic surgeon who had performed a good repair on a friend, and who came highly recommended. After an initial consultation, the diagnosis was aided by a Gadolinium-enhanced MRI and X-ray. This involved pumping a fluid into the joint which contained Gadolinium (a rare earth with ferromagnetic properties, Gd on the periodic table). Examination of MRI showed fluid pockets where the labrum should have been attached to the glenoid, and also under the rotator cuff at the top of the humeral head. The diagnosis was a SLAP lesion. This was probably related to an untreated injury of the shoulder about 20 years before, when I had had it wrench backward on entry to the water after a bad dive off a springboard. At the time, I was more concerned with getting to the surface of the water for breath and not looking too stupid. In retrospect, even though the shoulder stopped hurting after a while, this was probably a subluxation (a partial dislocation) of the shoulder. The consequent loosening of the joint has caused me a little trouble since then (I've not been able to throw balls over-arm, which should have been another clue), but it had been tolerable. The decision to go ahead with surgery was again a hard one, especially since the shoulder had been feeling better in the latter part of the summer. The factors that influenced me most were the poor blood supply to the cartlidge and the age of the injury led me to conclude that there was no chance for spontaneous healing. At the rate it was deteriorating, I would probably have had to give up archery in a couple of years. The operation gave hope that this could be averted, or at least delayed rather longer. The operation was performed arthroscopically on the 23rd September 2002, at Orthopedics International in Seattle. When I arrived for the outpatient procedure, I had a higher blood pressure than normal, perhaps from worrying that Ivonne would run my car into something (sorry!). The operation itself took about two hours, but started about an hour late. 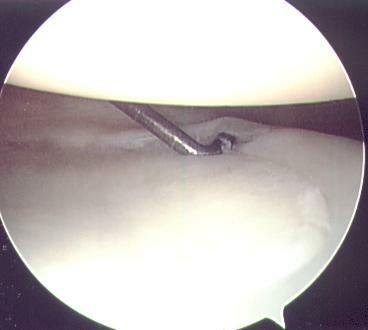 Photos taken during the operation show a badly torn superior labrum (an unstable type 2 SLAP tear). This photo shows the tear extending into the attachment of the biceps tendon. A 90-degree probe is being used to examine the extent of the tear. The probe is pushed between the biceps tendor (top left) and the humeral head (top right). 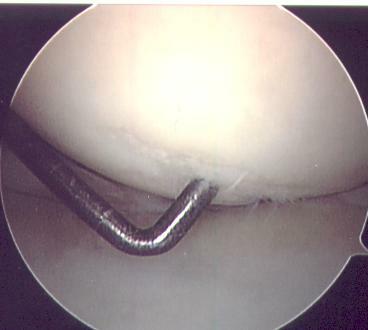 Compare the previous picture with a picture of a healthy labrum, or with the picture above of the stable anterior labrum. The probe is not able to part the labrum and glenoid. 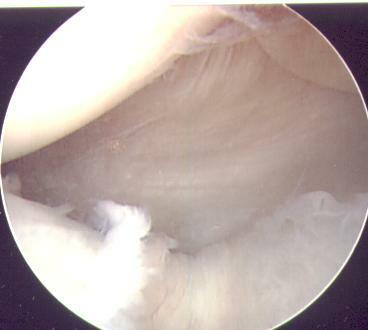 There was also a small radial tear of the anterior/inferior labrum shown on the MRI scans. This photo of it shows it is not very extensive. The axillary pouch was moderately large, indicating looseness of the joint capsule. One aspect of the shoulder problem that did not show up on the MRI or X-rays was grade 3 chondromalacia of the humeral head, shown in this picture. This is a wearing away of the sheath covering the bone, and is more common in knees (it is sometimes referred to as ``runner's knee''). Grade 3 chondromalacia is nearly worn through to the bone. This discovery has made me more positive that having the operation was the right thing to do. Reducing the abnormal motion of the joint may prevent the rubbing that was damaging the sheath. The repair involves burring the bone of the shoulder capsule, causing it to bleend, and then putting a couple of dissolvable bone anchors ($550 on the itemised bill!) into the glenoid and suturing the sides of the labrum tear to the anchors. The increased blood flow and burr damage to the bone provokes the healing response, allowing the immobilised labrum to re-attach to the glenoid. This photo shows the final result, with the blue translucent sutures holding the tear together while it is probed. 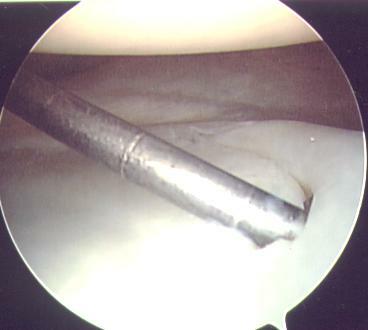 As well as the SLAP repair, the surgeon performed an electrothermal capsulorraphy to tighten the loose joint capsule. After the operation, I was driven home with my arm in an immobilisation sling, which it is expected to stay in for six weeks. There was very little pain following the operation; I took two painkillers the first night, then one a night for several nights after. The plans I had made for care worked out well; I was able to do most things one-armed. The biggest difficulties were in washing my hair, tying it back (I have long hair), and washing up the dirty dishes. Typing was very slow, but possible left handed. I tried to use the MicroSoft ``sticky keys'' accessibility feature, but gave up because it was more trouble than it was worth, and because it turns off if you chord any key sequences. The first week, essentially no motion of the arm was allowed. After the first follow-up visit on 1st October, the surgeon said it was alright to type two-handed, so long as the hand rested on the keyboard or in my sling. Physiotherapy started at this time, and my physiotherapist was allowed to perform passive range of motion exercises up to 90 degrees of flexion and abduction, and 30 degrees external rotation. In the second week, she added scapular mobilisation exercises and some isometric resistance. I am currently just entering the active-assisted phase, where the arm is moved through the same range with a little muscle power and assistance from the other hand. After the second follow-up visit on the 15th of October, the doctor removed the range limitations and replaced them with ``as much as I can tolerate''. Just the day before I'd been reading an article about how redheads feel more pain, so I'm not sure how much that will be! One unexpected consequence was short term weight loss; I lost 5lb in first week, and my weight seems to be staying down. I wouldn't recommend this as a way of dieting, though . The frustration factors were: I couldn't drive. I couldn't fly. No karate. No archery. No fishing. No skiing. I tried to go for short walks every day to stop it from getting too boring. Update: after six weeks, I was able to stop using the sling. I am still in physiotherapy two days a week, partly due to concerns about adhesive capsulitis. My range of motion and strength in flexion are improving, but abduction is still very limited and painful. 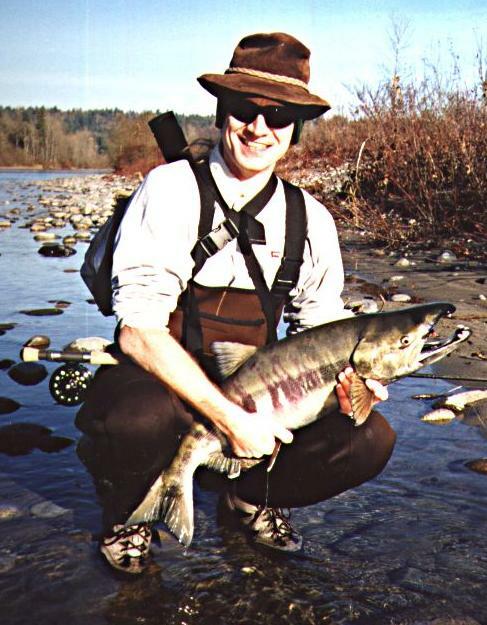 I have been able to go fishing a couple of times (the motion is mostly flexion), and eight weeks after the surgery, I caught a 12 pound chum salmon! Update: after three months, I am back to skiing. My Telemark skills have improved considerably from not using the shoulder. I have also just convinced my doctor that I have sufficient range of motion and strength to return to flying. Flexion and extension are very good. Adduction and abduction are good. External rotation is still a little bit restricted, and I am also still in the process of re-building the shoulder muscle, so I am not drawing my own bow. I have been able to shoot a 20lb training bow. There is still a small sign of the adhesive capsulitis; the humeral head does not glide properly into the socket in full abduction. Update: after seven months, I have finished physical therapy. I have just finished my first archery tournament of the year, and am quite pleased with the results. 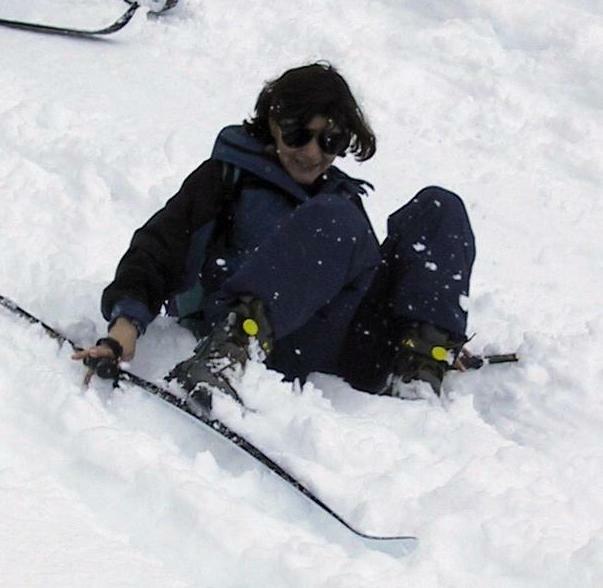 I have returned to karate as well, and have been skiing a bit too. A fall while skiing shortly after the last update had me very worried for a while, thinking I might have ripped the repair. It may have actually done some good, by breaking up scar tissue in the joint. I am still doing strengthening exercises; external rotation in that arm is much weaker than the other side. I have very close to full range of motion back. Update: the archery in 2003 didn't go as well as I had hoped. There was still persistant pain in the joint from the chondromalacia, so I quit shooting early for the year. After some experimentation, I found that I can shoot lighter weight limbs without the same pain, so I have now bought some newer, faster, 36lb limbs and weaker arrows.